We have almost arrived, with many new reasons to engage our work, at the end of 2017.What a year it has been! Year’s end provides good occasion to look back in time, as a means to re-assess the future. 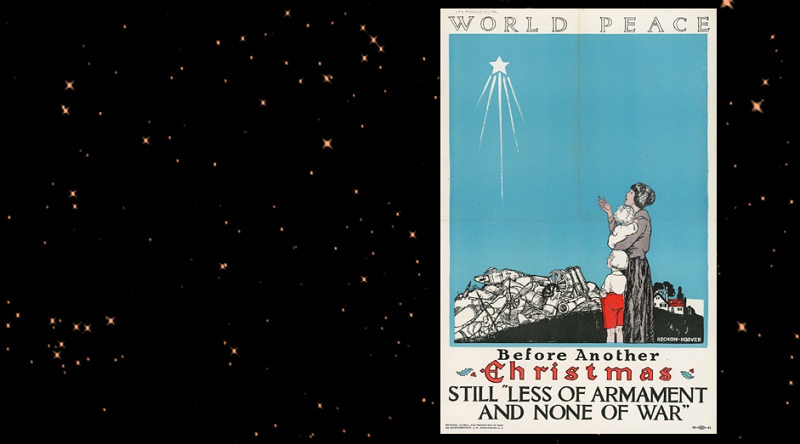 For this, we have drawn on our archives where we found the above poster, which was produced between 1919 – 1920, by the National Council for Limitation of Armaments. 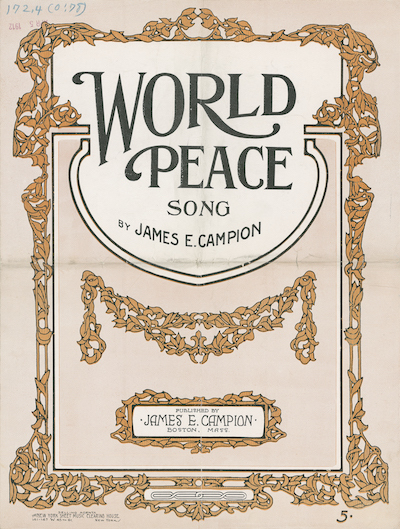 Our archive also holds the “World Peace Song,” stamped with the date of April 5, 1912, with lyrics by James E. Campion set to the tune of Auld Lang Syne. So the peace deal can be signed? So the peace deal can be signed! And the peace deal shall be signed! And surely I’ll hae mine! When the peace deal has been signed! Let the peace deal now be signed! From a world that’s full of dread? We could spend on peace instead? Could spend on peace instead! If we spend on peace instead! To cruel states and benign? When the contract’s sealed and signed? Once the contract’s sealed and signed! So buy these arms of mine! We’ll only get a fine! So we’ll only get a fine!